According to the University of Oregon’s Holden Leadership Center, businesses should strive for open communication between employees and management – collaboration. The success (or failure) of your business can be attributed to many things. There are the obvious factors – product/service, employees, management, and customer service – and then there are the not-so-obvious factors – trust, communication, happiness, and collaboration. Each plays a very important role in how your business operates. The Merriam-Webster Dictionary defines collaboration as the ability “to work with another person or group in order to achieve or do something.” In other words, collaboration is teamwork. In the words of Mattie Stepanek, “Unity is strength… when there is teamwork and collaboration, wonderful things can be achieved.” It’s science! According to the University of Oregon’s Holden Leadership Center, businesses should strive for open communication between employees and management – collaboration. However, collaboration does not always come naturally. Sometimes you, as a manager or employer, must urge your employees to work together. But how? How Do Employees View Current Collaboration? How do you define collaboration in our organization? Are you motivated to collaborate? How could our organization benefit from better collaboration? Understanding employee perception can help identify weak spots within your organization and allow you to map out a plan to improve collaboration and business processes. In 1938, John Dewey wrote that “there is an intimate and necessary relation between the processes of actual experience and education.” What he was referring to is experiential learning. Humans learn better by doing. So instead of lecturing your employees on the value of collaboration, get out of the office and show them the benefits of teamwork. Presented in a fun and creative way, team building exercises help break down communication barriers and encourage collaboration amongst your employees – ALL of your employees. 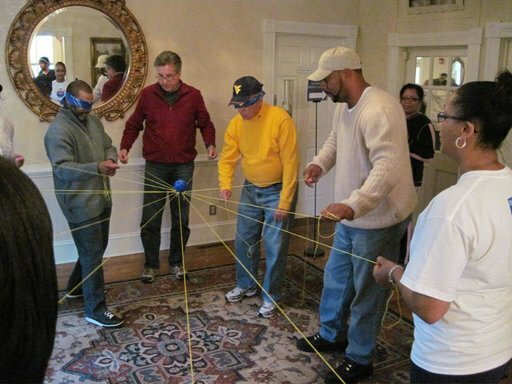 Click Here to Schedule Your Team Building Event! Terrapin Adventures is conveniently located in Howard County, Maryland, between Baltimore and Washington DC. Our experienced staff is able to create a custom team building program– onsite or offsite, indoor or outdoor – that is designed to help your group increase their ability to problem solve, think creatively and collaborate with one another. We service Maryland and Washington, D.C., and have traveled to other states as well. If you have any questions, please call Terrapin Adventures at 301.725.1313, or email us at info@terrapinadventures.com to learn more. This entry was posted on Thursday, December 3rd, 2015 at 8:33 am. Both comments and pings are currently closed.